Pick of the Week: Sweetness or Destruction? 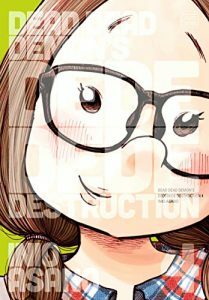 SEAN: It has to be Dead Dead Demon’s Dededede Destruction for me, a series that gets more riveting with each volume, though I think the ‘lighter and fluffier’ promise the author made about this one may be leaving town soon. KATE: Since Sean has beat the drum for Dead Dead Demon’s Dedededestruction, I’ll recommend the second volume of Wandering Island instead. The first volume arrived in stores way back in 2016, and barely registered with manga readers. That’s a shame, because Kenji Tsurata’s artwork is flat-out terrific, as is his plucky aviator heroine Mikura. A few critics caviled about the fanservice and the plot, but this Grumpy Old Feminist gives it two thumbs way up. ASH: There are a lot of great manga being released this week; I’ve got my eye on every series that’s been mentioned so far. I’ll take the opportunity to highlight one more, though, since it’s been more than three years since the release of the first volume of Die Wergelder in English. The series is essentially a pinky violence film in manga form. Steeped in extreme brutality and exploitative eroticism, it’s understandably not for everyone. ANNA: I’m going to joint with Sean in picking Dead Dead Demon’s Dededede Destruction. I procrastinated reading this series for a long time, and once I tried it I was absolutely riveted. MELINDA: I’ll admit that I don’t have a solid pick this week, and even with the title I’m most interested in, I’m already eleven volumes behind. But I’ll just go ahead and back Michelle up here on Sweetness and Lightning. I think I really do need to check it out. Yay, Wandering Island! I’m looking forward to vol. 2 myself. Surprised to hear that some critics were down on the first volume; I thought it was lovely, and Dark Horse did a great job with the presentation, too.